One of the things I always bring with me whenever I go out is a scarf, I always wear a wool scarf in Winter but I adore wearing a silk scarf during the Spring and I bring it with me even for Summer nights out !. Silk carves keep being added to my collection and the best thing is that I've been using some of them for many years already and I always like them a lot, just like the Hermès one I am wearing in these pics. I think a nice silk scarf can add something special even to a simple outfit plus it's very useful when it's windy, don't you agree with me ? Moreover, when I get tired of wearing it, it can be easily stored into my bag ;-). 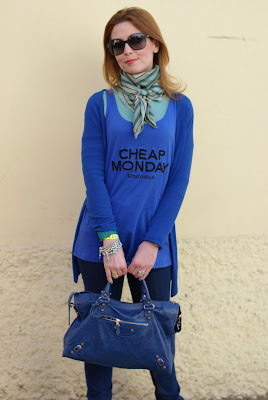 Una delle cose che porto sempre con me quando esco è una sciarpa, indosso sempre una sciarpa di lana in inverno ma adoro i foulard in seta in primavera e li porto spesso con me anche per le serate estive !. I foulard di seta continuano ad aggiungersi alla mia collezione e la cosa migliore è che alcuni li uso da molti anni e continuano a piacermi molto, proprio come quello di Hermès che indosso in queste foto. 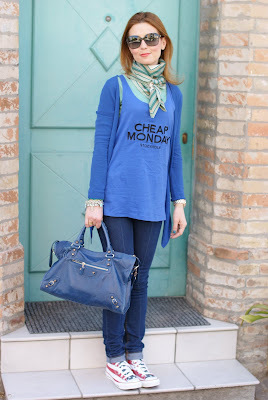 Credo che un bel foulard in seta possa aggiungere qualcosa di speciale all'intero outfit inoltre è molto utile in caso di vento, non credete anche voi ? Inoltre, se mi stancassi di indossarlo, può essere facilmente riposto in borsa ;-). I am a fan of Cheap Monday jeans, I love them also cause they are often high waisted and this means being comfier and more feminine, these are brand new and the name of the model is "second skin dark prest". I have decided to go for a layered look, wearing a Cheap Monday cobalt blue tank top with a Zara basic top underneath and an asymmetrical blue cardi from Northland. This is the right kind of outfit for such a crazy weather that goes from very hot to chilly in the same day !. My beloved Chucks with a stars and stripes print and my Balenciaga city completed the look !. 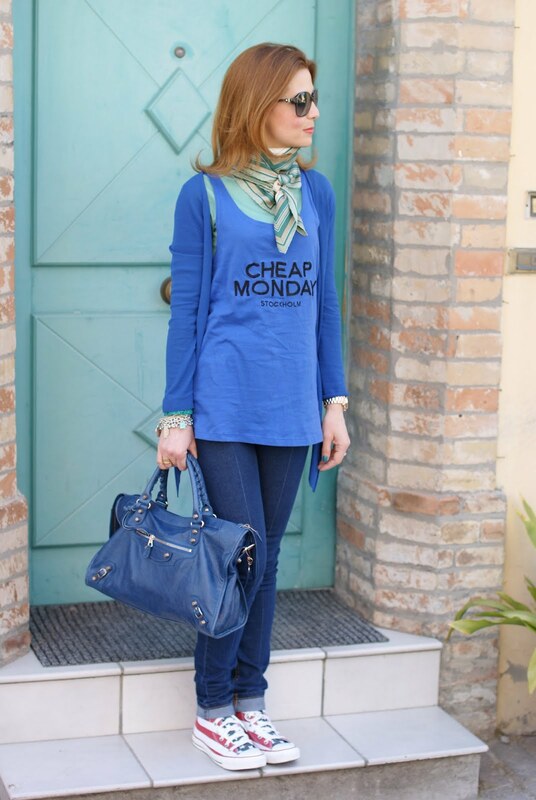 Sono una fan dei jeans Cheap Monday, li amo anche perché sono spesso a vita alta e ciò per me significa maggiore comodità e femminilità, questo modello è nuovo e si chiama "Second Skin Dark Prest". Ho deciso di adottare il look "stratificato", indossando una canotta blu cobalto sempre di Cheap Monday sopra ad una maglia basic a maniche lunghe di Zara e aggiungendo un cardigan asimmetrico blu di Northland. Questo tipo di outfit è sicuramente adatto ad un clima tanto pazzo che passa da caldissimo a fresco nel corso della stessa giornata !. 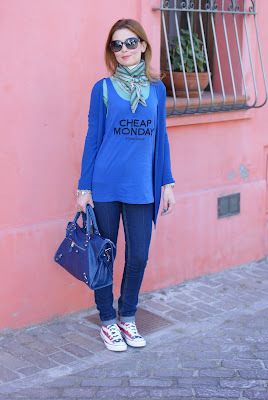 Le mie adorate Converse a stampa bandiera americana e la Balenciaga City hanno completato il look !. In these pics you can see my stack of bracelets, a couple of them are from Tiffany and I wear them all the time ! My followers on Twitter and Facebook already know that the other day I was so sad cause I thought I had lost a charm, a lock that has a meaning to me, then I have luckily found it on the floor when I had lost hopes ! Now I am thinking about getting them all treated with a welding so that I don't risk them to fall out anymore !. In queste foto potete vedere i miei braccialetti, un paio sono di Tiffany e li indosso sempre ! I miei followers su Twitter e Facebook sanno già che un paio di giorni fa ero triste perché pensavo di aver perso un charm, un lucchetto che ha un significato speciale per me, poi l'ho fortunatamente ritrovato proprio quando avevo perso ogni speranza ! Ora sto pensando di farli saldare tutti in modo da non rischiare più che possano cadere !. So pretty! Love your scarf! 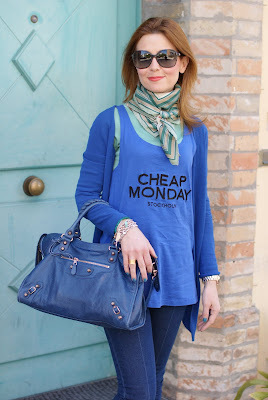 Beautiful scarf, I love the color! Love the way knotted the scarf. 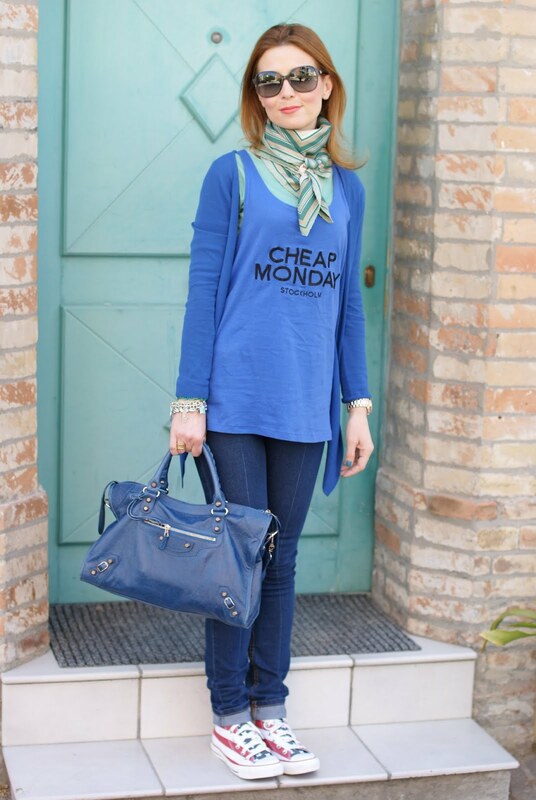 Great blue outfit! Scarf is something I usually take with me, too! Aww your bag is awesome! the scarf and top go together so well!! definitely lovin that blue for summer! piacciono molto anche a me! 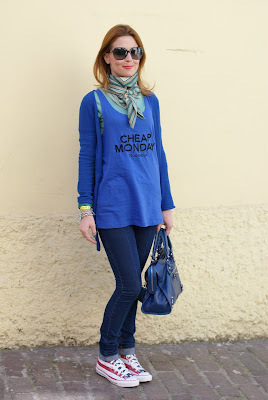 complimenti x l outfit! You look great! What a great mix of brands! This is such a chic casual look, as I would expect anything less from you! Your bag is to die for, I love it! Have an amazing rest of the week, darling! 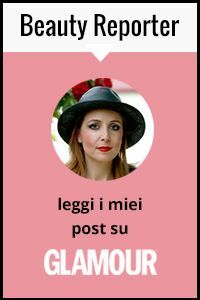 Che bello il tuo blog! Ci seguiamo a vicenda? love the, and the bag too!! vale, your scarf adds just the right touch of elegance & sophistication that defines your style! definitely weld your charms. it would break your heart if you lost them. I like scarves too. Not only are they great accessories, they keep you warm too. Yours is so pretty. So casual and cute! I like the look sweetie! So beautifull! 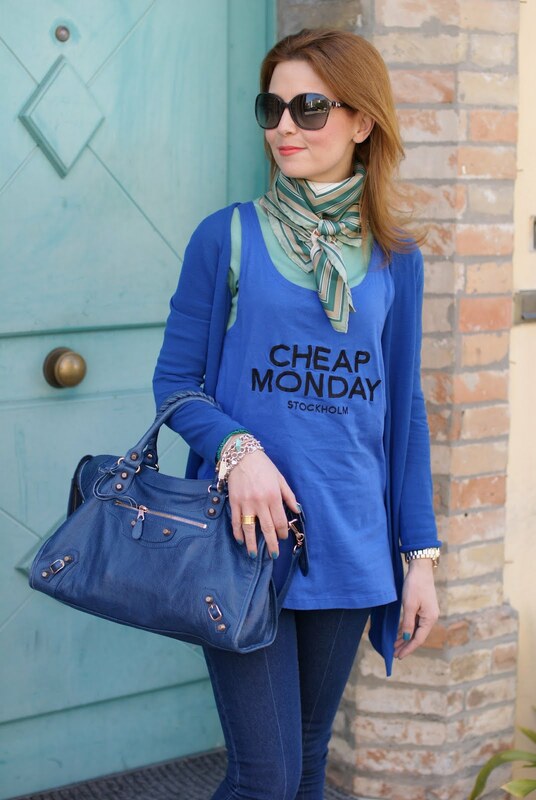 Love your bag and the blue/purple color you chose for your outfit! OMG la Balenciaga... che sogno!! E' una delle borse per cui vorrei risparmiare e regalarmela... ma ci sono così tanti colori, come si fa a scegliere? 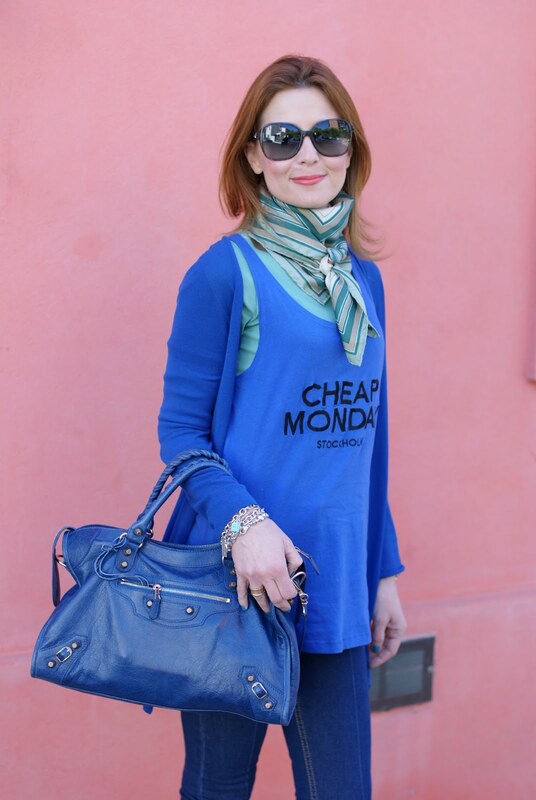 Great look, love the scarf and bag. Yes, we can follow one another. I'm following now. Love all the blue and your shoes look so amazing and comfy. Thanks for sharing! 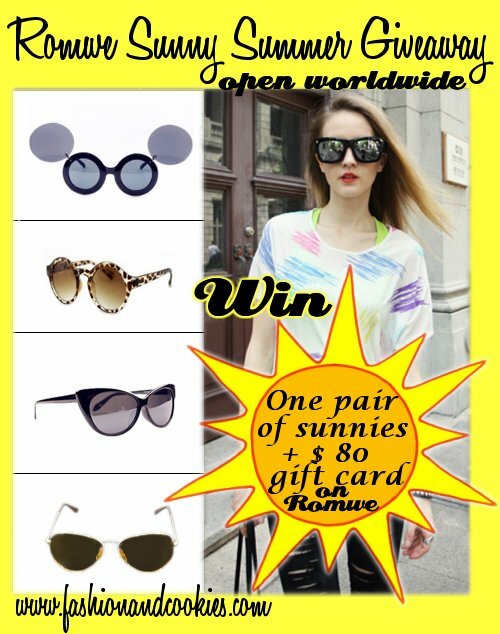 P.S.- I'm also hosting a giveaway at the moment and invite you to enter if you'd like :) Check It Out Here. just followed wherver i could! Hi I loved your visit reciprocates the visit to your beautiful blog congratulations! Hello ! Loved this outfit, sporty yet classy ! Molto bello questo outfit!! Grazie x essere passata da me, smack! 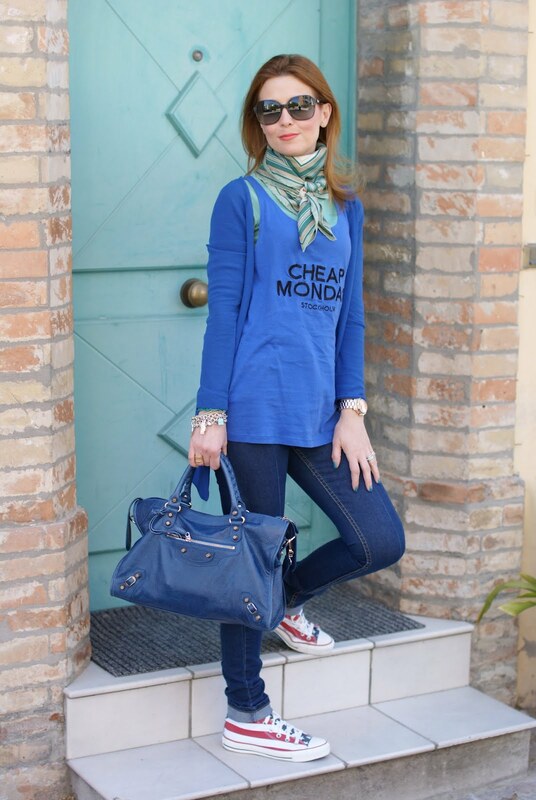 such a classic casual look! i love cheap monday as well. she manages to take very classic styles and add unique details that make you want to wear them forever.